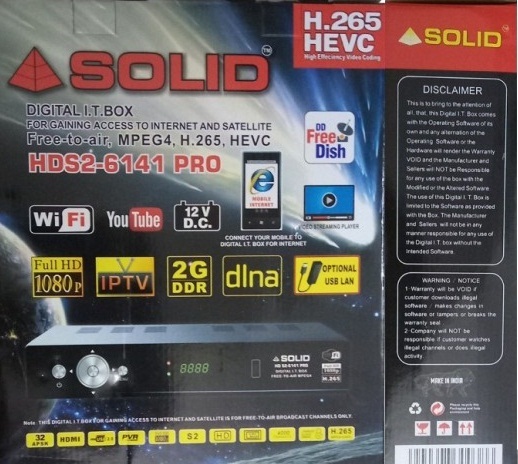 Finally SOLID launched brand new set-top box HDS2-6141Pro, it is upgraded version of HDS2-6141. Now you have question in your mind that what is new in this set-top box? Sure! We will let you know about this that the best features are that company replaced its decoding chipset, now it is upgraded to H.264 to H.265. So it means now you can watch HEVC free to air channels in this box. We have also found few other features like now you can access mobile videos, music and photos by DLNA app. For this you have to download Surplus Remote control application from Google Play Store and connect you box with your mobile using hotspot. 1GB in HDS2-6141Pro and 2GB in HDS2-6312, both models have H.265 / HEVC Supported Chipset.